In this lesson, we will learn how to apply the laws of the uniform acceleration motion of a particle in a straight line. A particle is moving in a straight line such that its acceleration 𝑎 = − 3 / m s 2 and its initial velocity is 39 m/s. Find its displacement during the time interval from 𝑡 = 1 to 𝑡 = 9 s e c o n d s .
The figure shown is a speed-time graph for a body moving in a straight line. Given that its initial speed was 5 m/s, determine the body’s acceleration during the part of the journey where the body was accelerating. The figure shown is a velocity-time graph for a body moving in a straight line with an initial velocity of 10 m/s. Determine the total distance covered by the body, given that it came to rest 100 seconds after it started moving. The figure shown is a velocity-time graph for a body moving in a straight line. Determine the deceleration of the body during the final section of its movement, given that it came to rest 100 seconds after it started moving. A particle moves along the 𝑥 -axis in the direction of 𝑥 increasing. It starts at 𝑥 = 3 7 c m with an initial velocity of 47 cm/s and moves with uniform acceleration of 51 cm/s2 in the same direction as its motion. Determine its velocity and its displacement from the origin after 6 seconds. A particle was observed moving in a straight line. Its velocity was measured 7 seconds after it was first observed and was found to be 188 cm/s. It was measured again 22 seconds after the initial observation and was found to be 86 cm/s. 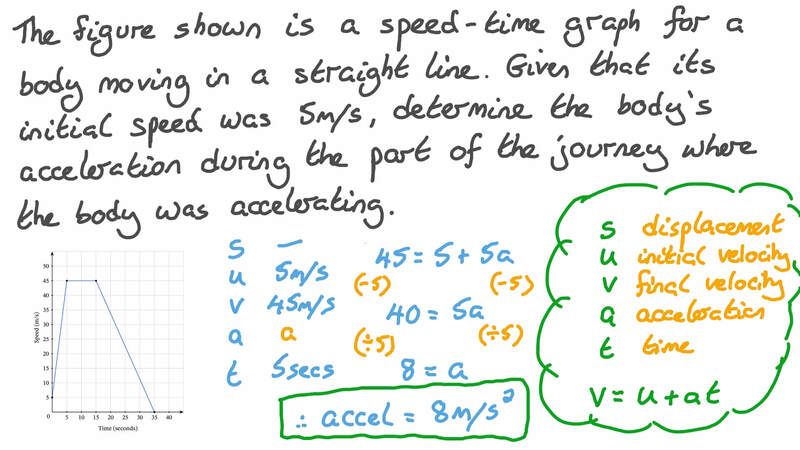 Assuming that its acceleration was constant, find its initial velocity. A particle, accelerating uniformly at 50 cm/s2, was moving in a straight line. 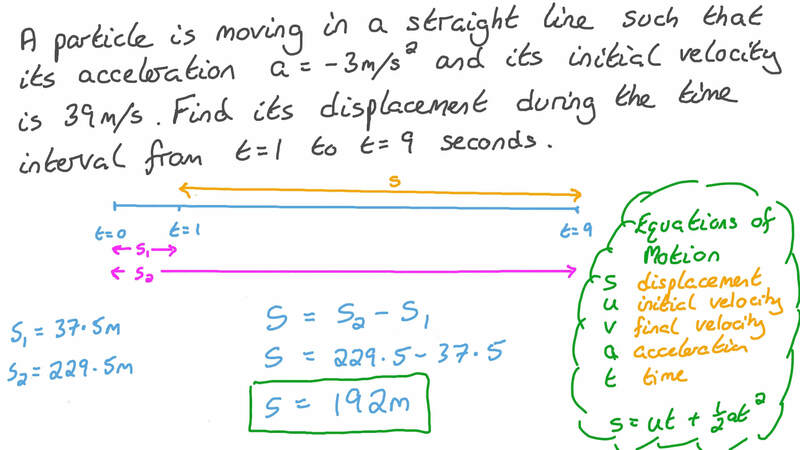 If its initial velocity was 45 km/h in the same direction as the acceleration, find the time required for it to cover 54 m.
A particle started moving in a straight line at 7 m/s. Given that its acceleration was of magnitude 2 cm/s2 in the opposite direction to its movement, find the time taken for the particle to come to rest. A particle was moving in a straight line at 172.8 km/h. If it decelerated over 120 m to come to rest, find the deceleration 𝑎 of the particle and the time 𝑡 taken to cover this distance. Determine the time required for a particle to increase its velocity from 7 m/s to 18 m/s over a distance of 269 m, given that it is moving in a straight line with a uniform acceleration. The figure shown is a velocity-time graph for two cars moving in a straight line. The movement of car 𝐴 is represented by the green line, and the movement of car 𝐵 by the blue line. Determine how long it took for the two cars to meet again, given that they started from the same point. A particle, moving in a straight line, was accelerating at a rate of 22 cm/s2 in the same direction as its initial velocity. If the magnitude of its displacement 10 seconds after it started moving was 29 m, calculate the magnitude of its initial velocity 𝑣 0 and its velocity 𝑣 at the end of this period. A particle started accelerating from rest at 40 cm/s2. When its velocity reached 11 m/s, it started decelerating at a rate of 40 cm/s2 until it came to rest. Find the total time 𝑡 during which the particle was moving and the distance 𝑑 it covered. A body, moving in a straight line with a uniform acceleration of 2 m/s2, covered 136 m before it stopped accelerating. It continued to move at the velocity it had acquired for a further 27 seconds. Given that the total distance covered by the body was 1 162 m, find its initial velocity. A particle was decelerating in a straight line at a rate of 4 cm/s2. If it momentarily came to rest 10 seconds after it started moving, find the distance it covered in 18 seconds. A small ball was projected horizontally in the opposite direction of the wind at 42.9 cm/s to move in a straight line with a retardation of 7.5 cm/s2. Find the time taken for the ball to return back to the point of projection. A particle was moving with a constant acceleration 𝑎 such that it covered 750 cm in 12 seconds. When its acceleration was increased to 2 𝑎 , it covered a further 500 cm in 4 seconds. After that, it started decelerating at a rate of 3 𝑎 until it came to rest. Find the value of 𝑎 and the total distance covered by the particle 𝑥 . A particle, starting from rest, began moving in a straight line. It covered a distance of 125 m while accelerating uniformly at a rate of 10 m/s2. Then, maintaining the velocity that it had gained, it covered a distance of 479 m. Finally, it decelerated uniformly at a rate of 5 m/s2 until it came to rest. How long was the particle moving for? A body started moving in a straight line from rest. Accelerating uniformly, it covered 450 m until its speed became 50 m/s. Continuing at this velocity, it covered a further 500 m. Finally, it decelerated uniformly over 200 m until it came to rest. Find the acceleration 𝑎 of the body over its final 200 m and the time 𝑡 taken to cover the whole distance. If a particle which was moving in a straight line with an initial velocity 𝑣  started decelerating at a rate of 10 m/s2 such that it came to rest 5 seconds later, what would the body’s velocity be 6 seconds after it started decelerating? Let the direction of the initial velocity be the positive direction. Given that a particle started moving from rest with a constant acceleration of 3.5 m/s2 until its velocity became 378 km/h, find the distance it covered. A particle started moving in a straight line from rest with a uniform acceleration of 5.4 m/s2. Determine its velocity after 2 seconds from when it started moving. A car was moving in a straight line at 45 km/h. Given that the velocity decreased at a constant rate until the car came to rest 10 seconds after the driver hit the brakes, calculate the deceleration of the car. A particle started moving from rest in a straight line with a uniform acceleration of 15.3 cm/s2. If, whilst accelerating, it covered a distance of 7 cm, determine its velocity after it travelled this distance. A car that was moving in a straight line started slowing down. Its velocity decreased uniformly from 92 km/h to 52 km/h over 20 seconds. Given that it maintained a constant rate of deceleration, how much farther would the car travel before it came to rest?